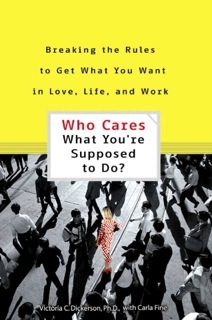 This advice book isn’t as naughty as it sounds: Dickerson is a clinical psychologist with years of experience working with women in their 20s and early 30s, and her goal is to help them free themselves from others’ expectations. Friendly and understanding, she encourages young women to trust their intuition about what they want and to identify their own values. They might even find that they want what society proposes for them (say, marriage or a career), but they should be empowered to achieve these things on their own terms, Dickerson says. Chapter by chapter, she deals with the commands that weigh down young women (Get a Man, Look Good, Be Thin, etc.) and shows them how to apply her four steps: name the problem, understand and challenge the expectation, recognize your own values, and find allies against self-doubt. Breaking the rules isn’t as easy as it sounds, but with Dickerson’s warm support, young women may have an easier time accepting themselves and their own choices. “An intriguing and dramatic conversation that engages readers as partners and participants in an experience similar to the experience of clients in narrative therapy . . . This book offers a new and different way of involving clients and therapists in unmasking the influence of larger cultural narratives that constrict their choices.” — Rachel T. Hare-Mustin “If narrative therapy is akin to a language of its own, then, undoubtedly, the best way to approach a new language is though immersion in it. Dickerson, V.C. (2014). The advance of poststructuralism and its influence on family therapy. Family Process 53, 401-414. Dickerson, V.C. (2012). Patriarchy, power, and privilege: A narrative/ poststructural view of work with couples. Family Process , 52, 102-114. Dickerson, V. C. (2011). Insider knowledge. Family Process, 50, 561-566. Dickerson, V.C. (2010). Positioning oneself within an epistemology: Refining our thinking about integrative approaches. Family Process, 49, 349-368. Dickerson, V.C., & Crocket, K. (2010). “El Tigre, El Tigre”: A story of narrative practice. In A. Gurman (Ed.) Casebook of couple therapy. New York: Guilford Press. Dickerson, V. C. (2009). Continuing narrative ideas and practices: Drawing inspiration from the legacy of Michael White. Family Process, 48, 315-318. Dickerson, V. C. (2006). Remembering the future: Situating oneself in a constantly evolving field, Journal of Systemic Therapies, 26, 23-37. Dickerson, V. (2004). Young women struggling for an identity. Family Process, 43, 337-348. Dickerson, V.C. (2004). Allies against self-doubt. (Special edition on narrative, P. Kelley, Ed.) Journal of Brief Therapy 3(2), 83-85. Dickerson, V.C. (2004). Teaching and learning narrative therapy (web site only). In C. L. Rabin (Ed. ), Understanding gender and culture in the helping process. Thompson*Wadsworth. Dickerson, V. C. (2001). 5 ways to use the Internet in Your Practice. Family Therapy Networker, 25 (2): 34-36. Dickerson, V. C. (2010). Positioning oneself within an epistemology: Refining our thinking about integrative approaches. Family Process, 49, 349-368. Dickerson, V. C. (2009). Introduction to the special section–continuing narrative ideas and practices: Drawing inspiration from the legacy of Michael White. Family Process, 48: 315-318. Dickerson, V. C. & Crocket, K. (2010). El Tigre, El Tigre: A story of narrative practice. In A. Gurman (Ed. ), Clinical Casebook of Couple Therapy (pp. 153-180). New York: Guilford Press. Dickerson, V. C. (2006). Remembering the Future: Situating Oneself in a Constantly Evolving Field. Journal of Systemic Therapies. Dickerson, V.C. (2004). Allies Against Self-Doubt. Brief Therapy. Dickerson, V. C. (2004). Young Women Struggling for an Identity. Family Process, 43: 337-348. Dickerson, V. C. (2001). 5 ways to use the Internet in Your Practice. Psychotherapy Networker, 25 (2): 34-36. Dickerson, V. C., & Zimmerman, J. L. (1996). Myths, misconceptions, and a word or two about politics (Special edition on narrative, J. L. Zimmerman & V. C. Dickerson, Eds.). Journal of Systemic Therapies. Dickerson, V. C., & Zimmerman, J. L. (1995). A constructionist exercise in anti-pathologizing. Journal of Systemic Therapies, 14: 33-45. Dickerson, V. C., & Zimmerman, J. L. (1993). A narrative approach to families with adolescents, (pp. 226-250). In S. Friedman (Ed. ), The new language of change: Constructive collaboration in psychotherapy. New York: Guilford. Dickerson, V. C., & Zimmerman, J. L. (1992). Families with adolescents: Escaping problem lifestyles. Family Process, 31: 351-363. Dickerson, V. C., Zimmerman, J. L., & Berndt, L. (1994). Challenging developmental “truths”: Separating from separation. Dulwich Centre Newsletter, 4: 2-12. Zimmerman, J. L., & Dickerson, V. C. (1993a). Bringing forth the restraining influence of pattern and relationship discourse in couple’s therapy, (pp. 197-214). In S. Gilligan & R. Price (Eds. ), Therapeutic conversations. New York: W.W. Norton. Zimmerman, J. L., & Dickerson, V. C. (1993b). Separating couples from restraining patterns and the relationship discourse that supports them. Journal of Marital and Family Therapy, 19: 403-413. Zimmerman, J. L., & Dickerson, V. C. (1994a). Tales of the body thief: Externalizing and deconstructing eating problems, (pp. 295-318). In M. Hoyt (Ed. ), Constructive therapies. New York:Guilford. Zimmerman, J. L., & Dickerson, V. C. (1994b). Using a narrative metaphor: Implications for theory and clinical practice. Family Process, 33: 233-246. Zimmerman, J. L., & Dickerson, V. C. (1995). Narrative therapy and the work of Michael White. In M. Elkaim (Ed. ), Panorama des therapies familiales. Paris: Editions du Seuil. Zimmerman, J. L., & Dickerson, V. C. (1996). Situating this special section on narrative. (Special edition on narrative, J. L. Zimmerman & V. C. Dickerson, Eds.). Journal of Systemic Therapies. Zimmerman, J. L., & Dickerson, V. C. (1996). 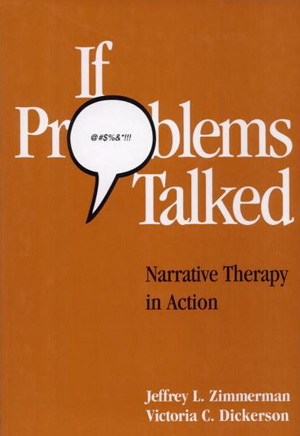 If problems talked: Narrative therapy in action. New York: Guilford. Zimmerman, J. L., & Dickerson, V. C.( 2001). Narrative therapy. In R. Corsini (Ed. ), Handbook of Innovative Psychotherapies. John Wiley & Sons. Berndt, L., Dickerson, V.C., & Zimmerman, J. L. (1997). Tales told out of school. In C. Smith & D. Nylund (Eds. ), Narrative therapies with children and adolescents. New York: Guilford. Janowsky, Z., Dickerson, V. C., & Zimmerman, J. L. (1995). Through Susan’s eyes: Reflections on a reflecting team experience. In S. Friedman, (Ed. ), The reflecting process in action. New York: Guilford. Neal, J., Zimmerman, J.L., & Dickerson, V.C. (1999). Couples, culture, and discourse: A narrative approach. In J. Donovan (Ed. ), Short-term couple therapy. New York: Guilford.